Landers Chrysler Dodge Jeep Ram of Norman has an awesome selection of Dodge Journeys available! First introduced to the world in 2009, the Dodge Journey is a fan-favorite for its super-spacious interior, familiar body style, and ultra-approachable price point. For its ten year anniversary, Dodge has several exciting updates planned for this small SUV, and we’re here to gather up all of that information for you in one helpful location. Let’s take a closer look at what exciting things may be coming to the upgraded 2019 Dodge Journey. Click here to view our available Journey inventory! Design: Available in 10 incredible color options, it’s never been easier to choose a Dodge Journey that’s perfect for you. Choose from Contusion Blue, Blood Orange, Billet, Bruiser Grey, White Noise, Pitch Black, Olive Green, Vice White, Redline, and Granite for epic customization. 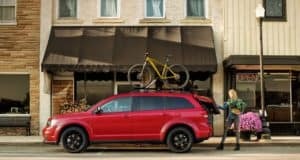 The 2019 Dodge Journey also features unique design elements like a distinctive front fascia, sharply sculpted fender flares, a striking crosshair grille, and optional dual exhaust tips that make a bold statement everywhere you go. Technology: Not only does the all-new Dodge Journey boast an undeniable sense of style, but it’s also fully loaded with the latest automotive technology to keep you safe and connected while on the road. For starters, an 8.4” touchscreen rests at the helm of the 2019 Dodge Journey, making music, navigation, and messages more accessible than ever before. The available (and award-winning) Garmin GPS Navigation System ensures that you and your Dodge Journey arrive swiftly and safely to your destination every single time. Additional tech features like the Parkview Rear Back Up Camera, the Parksense Rear Park Assist System, Brake Assist, and Electronic Roll Mitigation work overtime to keep you, your loved ones, and the all-new Dodge Journey safe no matter what. Performance: When it comes to performance, the all-new Dodge Journey doesn’t disappoint. Featuring two incredibly powerful powertrains to choose from, the 2019 Dodge Journey is one of the highest-performing SUVs on the market today. The standard 2.4-liter, 16-valve, 4-cylinder engine that arrives in the 2019 Dodge Journey produces up to 173 horsepower and 166 pound-feet of torque, while the available 3.6-liter V6 Pentastar engine generates an impressive 283 horsepower and up to 260 pound-feet of torque! And with the 3.6-liter V6 Pentastar engine equipped, the latest Dodge Journey can tow up to 2,500 pounds for all of your hauling needs. 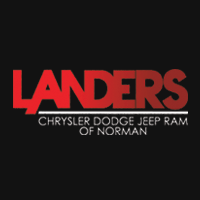 Ready to check out all we have to offer here at Landers Chrysler Dodge Jeep Ram of Norman? Click here now!